Since there are 35 bowls, after the end of play on Saturday.... we won't even be halfway through. Technically, the mid-point of bowl season comes on Monday, at halftime of bowl #18, the Oregon-Texas Alamo Bowl. (Because there will have been 17 and a half bowls played, and 17 and a half to go.) For these bowls, however, we will have one of my favorites, and it also proves just how crazy bowl season has gotten. A note, just in case you're new here: MSC refers to "Monkey Specialty Category," which is a fancy way for us to categorize bowl games by their worthiness or unworthiness. There was a website called "3 Sports Monkeys" where guest picker Bob of Arabia and I made bowl predictions (among other things) and in tribute to that, the MSC was born. I've been to New York in late December. Being outside is not somewhere you want to be for very long. I mean, it makes sense for the largest city in America to have a bowl game, but I really hope there's a freak snowstorm. You know, a Super Bowl preview. 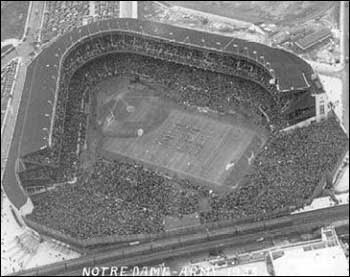 In a way, this bowl has major historical ties, because Notre Dame really captured the nation's attention by playing football at Old Yankee Stadium in the mid-20's, when they staged some pretty good bouts against Army. The Four Horsemen of the Apocalypse and all that kind of stuff. George Gipp, Knute Rockne, etc. The success of Notre Dame and Army at Yankee Stadium really let the founders of the NFL know that yes, America could sustain a pro football league. Notre Dame football was exciting and really something to watch. You know, as opposed to now. Honestly, who do I pick in this game? The team from Jersey, who could have taken the subway in.... or the team that I can't stand? Well, I like Corey Booker. Jersey it is. Should be noted that this is another game that's the only football game played in the stadium all year. That's two strikes against it. And it's cold weather. There's number three, making it a non-bowl game except for the part that it's in New York City. Should be better than any Jets or Giants home game played across the river all year. Historical note: Oregon State and Stanford actually feature prominently in Old Yankee Stadium college football history. The Beavs upset NYU in the first Thanksgiving day game there, in 1928. A week later, the As for the Cardinal, back when they were the Indians, shut out Army 26-0 in the largest-attended college football game ever at the place, 86,000. And in 1960, OSU was scheduled to play in the first bowl game in NYC, the Gotham Bowl, but it was cancelled when they couldn't find an opponent. What's the over / under on Yankee flashbacks, Yankee player close-ups, and Steinbrenner references during the telecast? Whatever it is, I'll take the over because there will be nothing else to talk about as this game enters the 4th quarter. I fully expect Tommy Rees and company to send multiple bombs over the Rutgers secondary (and that short porch in right). OK, it's Tommy Rees, so maybe not. In any event, the Irish will make sure the scoreboard operator is busy, regardless of how they do it. I would rant about how bad of an MSC game this is (essentially a Rutgers home game), but then there's the Belk Bowl. I have this thing where I try to avoid using the sponsor names when talking about bowls. 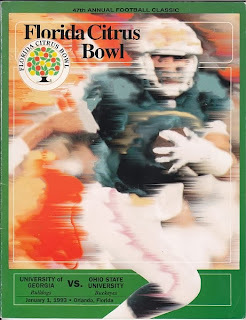 However, this particular bowl has never been played when it didn't have a sponsor, so the name that I used right there has never been actually used, except when it was announced that the bowl was being developed a decade ago. The thing is, even if I used the sponsor name of the bowl, you'd have no idea where it's played. Which goes against every reason a bowl game should be developed. Bob of Arabia will talk about the sponsor soon enough. As it is, the game is played in Charlotte, North Carolina, at the home of the Carolina Panthers. And North Carolina's in it. Two hours away. And the Tar Heels are 6-6. And this is Cincinnati's second straight appearance in this one. Sounds like a non-bowl game to me. Also, I’m taking the Bearcats. The stats say it should be a pretty close game, however. Yeah, at one in the afternoon I think I have something better to do, like watch a college basketball game. If these two played in hoops, I’d definitely watch it. Aside from the Swamp Bowl earlier in the week, this is one of the more blatant MSC games of this bowl season. I had to look up what the hell a Belk was. Turns out it's a department store chain based primarily in the Southeast that is over 100 years old. 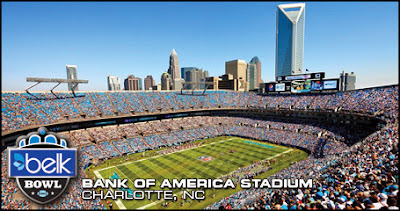 It was originally founded in 1888 in North Carolina, which explains the game's location in Charlotte. Wait, Charlotte? Aahh...I bet Belk is stocked to the gills with Tar Heel gear. Except for maybe the two within the Charlotte city limits, I'm also guessing Belk isn't stocked with any Cincinnati gear. I hope the Bearcats travel well. If not, that is going to be a seriously powder blue telecast. I can deal with it when USC goes to the Rose Bowl, LSU goes to the Sugar Bowl, Miami goes to the Orange Bowl (you get the picture) because those games are based on conference rankings and those teams are almost always in that mix. When a 6-6 North Carolina is invited to the Belk Bowl to play a team sporting a 9-3 record, something just ain't jivin' for this turkey. It won't be of the tar variety, but Cincinnati is gonna put a big ol' heel up Carolina's couch muscle. You brought this upon yourself Belk Bowl. They play it in the Citrus Bowl, but they don't call it the Citrus Bowl anymore. I'm sure Bob of Arabia will get some socks precisely because of that. But not oranges. Next year, this match-up will be a conference game, because Louisville's joining the ACC. Man, here I was hoping this would be a legitimate bowl game without having to pull out excuses like “well, it's in New York.” Considering this is in Orlando, that's kind of impossible. Seriously, how many bowl games do they play in Orlando? And are they all at different stadiums? I'm so confused now. Anyway, this one's totally watchable despite that, because Louisville quarterback Teddy Bridgewater is going to be a top five pick. Oh, he's a junior and could come back next year? Yeah, right. And Miami is on the way up, maybe, sort of, possibly. Let's face it, college football is more entertaining when Miami is good. It's all about the U. Louisville should win this one. If the 'Canes had Michael Irvin and Jim Kelly and Warren Sapp and Willis McGahee, different story. But they don't. This game is in Orlando, so I am preparing myself for tequila flashbacks as they show the requisite Disney World shots between commercials (see Wednesday's post for reference). My initial response when I saw the matchup was one of anticipation. Then, I realized it's a bowl game and not a March Madness round. That fact notwithstanding, I have a keen interest in this game. I am looking forward to watching Teddy Bridgewater play. I have only seen him once before...go figure, in his bowl game last year. From what the memory that survived the tequila rounds remembers, dude can ball. The Oakland Raiders are in the market for a franchise quarterback and will have a decent draft pick. Enter my interest. Teddy Bridgeraider, has a ring to it, ya? Cardinals send Teddy to the NFL Draft (and hopefully Dennis Allen's roster) a winner of his last collegiate game. This is one of my favorite bowls, celebrating it's 25th anniversary, and it's gone through lots of changes. It hasn't been known as the Copper Bowl for years, so you're forgiven for forgetting the name. It started in Tucson. It spent ten years there and moved to Phoenix, where they played it at a stadium that doesn't have football the other 364 days of the year, the Arizona Diamondbacks home field. Then, when they built the new stadium in Glendale and moved the Fiesta Bowl from Sun Devil Stadium to Glendale, the Copper Bowl moved to Sun Devil Stadium, and it's been there since. For now. The Copper Bowl was also one of the first bowls to straight-up change their name to a sponsor, they became the Insight Bowl in the late 90's. Now it's named for somewhere that's making me hungry even as I think about it. I've been to the Fiesta Bowl twice as a media representative, since that's sponsored by Tostitos we pretty much had as many Doritos and dips that we could handle. The first time I swore I would never eat Doritos again, I totally over-indulged. The second time I said the hell with it and pretty much ate a different flavor of chips every other day, and a different jar of dipping sauce every day. I had some really tasty toast. If I ever cover the Copper Bowl I'll be covered in hot sauce and bleu cheese dip for weeks. So for me, at least, this bowl game proves how bowl season has moved from a regional, vacation, fun-time experience for the fans and teams to a billion dollar business. When the Copper Bowl began, it was in Tucson and they played it at the University of Arizona stadium. It wasn't the biggest bowl game, and it wasn't in the biggest city, but neither is the Sun Bowl in El Paso. I think the Copper Bowl organizers looked at the Sun Bowl and saw a niche they could be a part of. But they began playing the game in 1989, right when bowl season was starting to explode, and a trip to Tucson wasn't as glamorous as a trip to San Diego. As the Fiesta Bowl two hours north of Tucson gained in popularity, the Copper Bowl people no doubt saw that they were getting left out. And it's a bummer, because I liked the Copper Bowl precisely because it was kind of out of the way. It's not out of the way anymore. In fact the Fiesta Bowl committee now runs the Copper Bowl, too. And that still makes it an afterthought, but it's a very desirable afterthought. As for who to pick in this game, it seems pretty even, according to the stats. When people ask me if I root for Ohio State or Michigan in “The Game,” I tend to respond “Michigan State.” I'm also a Kansas alum, so I'll go for my in-state brothers and pick the Wildcats.... who played in the Fiesta Bowl last year. I was there and they got roped by the Ducks. At least I think they did, I had Cool Ranch residue and artichoke dip covering everything by the time the game started. Now we're talking; I loves me some wings. I'll take the Bee-Dub-Dub marketing bait on this one. I'm banking on 2-for-1wings or beer specials or some other way to expand the boiler on the cheap during the game, so you guys know where to find me. We have a fat coach (Michigan) against an old coach (K-State). The game is sponsored by a friggin' sports bar, you do the math. I just hope they go triple overtime before Michigan wins so I can milk those 2-for-1 wings as long as possible. OK, you got me, I'm trying to milk the beer specials. Go Blue, just take your time.